The East Hanover First Aid Squad relies heavily on its equipment. The squad has a total of three ambulances and one incident command vehicle. However, we are in need of EMT's to put in the back of our ambulances. If you have some spare time, and would like to learn a little more about what we are about, join the squad. There is never a better feeling then being able to save someone's life! 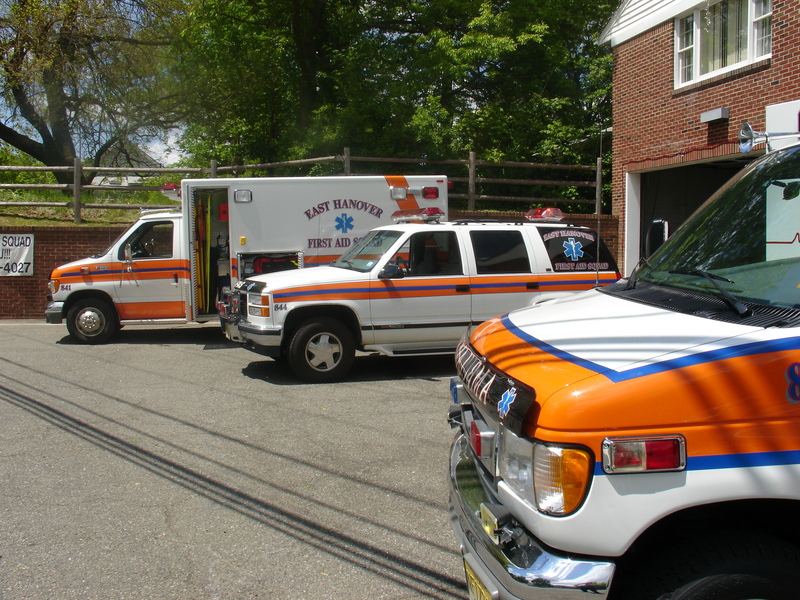 The East Hanover First Aid Squad owns three Horton ambulances. Our newest ambulance was delivered on December 22, 2005. The newest rig is a Horton Model 553 is a large-body ambulance with rugged durability, tremendous payload and exceptional handling. The Horton Custom Series 553 puts it all together on a Ford Super duty chassis. Length 169.00" | Width: 96.25" | Headroom 72"
Flexibility made Horton famous. Intelliplex takes that concept to a new level. Infinite flash patterns for the warning lights. Interior lighting levels to suit any need - it's all there. The customer has total control of how the switches work, how the lights work, and under what conditions certain responses or messages must occur. While the hardware in the vehicle may be the same, full programmability allows the customer to make the vehicle operate the way the department wants it to operate. No longer are you at the mercy of manufacturers who design a vehicle to operate only their way. If a later change is required or new features need to be added, a simple programming change updates the unit with little or no labor. The vehicle will not become obsolete - it is designed to keep up with the times. Horton Emergency Vehicles customers demand the best in design, function and safety. 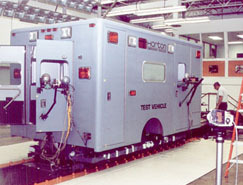 That is why Horton has pioneered crash testing among ambulance manufacturers. 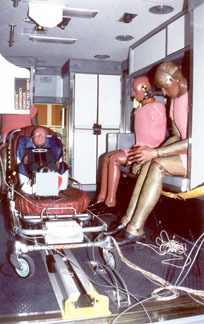 Horton began crash simulations on its bodies in 1974. As part of an on-going program, Horton tested again in October, 1999, to insure Horton designs provide the greatest protection to patients and ems personnel alike. With the click of a switch, Horton's exclusive Electronic Privacy Windows go from clear to opaque. At the site, you'll be able to provide your patients with the privacy they deserve. Once on the road, clear the window for the ride to the hospital. Traditional vehicle warning lights define the perimeter of your vehicle at an emergency scene. But what happens when you step out into traffic to work from an exterior compartment? Oncoming vehicles may or may not see your silhouette along side the ambulance. Now, with Horton's new exclusive Silhouette Safety Lighting™ system to widen the safety zone around you, you can concentrate on the job at hand.From a distance, these small-but-powerful lights outline the width of the open doors and the bottom of your vehicle with the same intensity of the upper warning lights. They define the entire ambulance, enveloping workers in a "silhouette of safety." From several feet away, the safety lighting is very intense. But, as a car approaches, the light changes to a bright but less intense glow. That same effect allows you to work close without interfering with your vision. Horton's cutting-edge technology is once again creating a new standard for your safety. Horton's exclusive Silhouette Safety Lighting system's new lighting technology won't strain your electrical system. 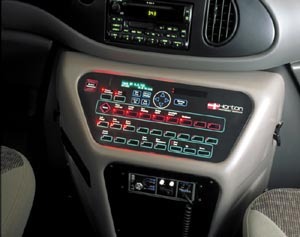 Using advanced LED technology, a complete rub rail and door package will use less amperage than one warning light. Each strip uses a mere tenth of an amp. Silhouette Safety Lights, with Horton's exclusive Lexan lens design, are recessed into the rub rails and exterior doors. There's no need to worry about contact with the lens. The Lexan will stay cool even after extended use. Silhouette Safety Lights in the interior access doors are set in stainless steel to compliment the finish and quality that only a Horton Emergency Vehicle can provide.